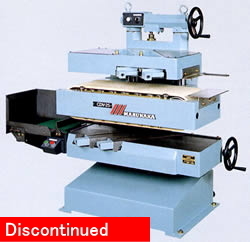 Feature NEWTON-W is a very unique machine that is developed to finish short & thin material like lamellas for chopsticks with high feed speed of 97 m/min.(50Hz). Double-knife system on top & bottom + special auto-return conveyor belt performs to plane both faces along with grains just by once putting the material. Feature RIGHT-AN 25 performs to finish side & bottom face (right-angle) of the material at the same time with each double knife system. 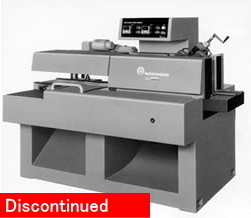 Feature An unique, four column type slicer for wide material upto 620 mm. Employed turn-table system for variable knife bias angle which can be adjusted according to the material. Most suitable for finishing ,for example, wider furniture parts etc. Super surfacers were developed originally for finishing wooden surface, but a lot of machines are being used for finishing of resin, plastic and other new advanced materials such as electronic materials. 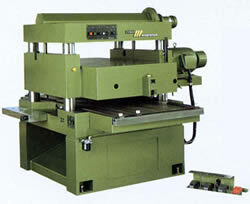 Send your workpiece to us ! We are pleased to test it for you.